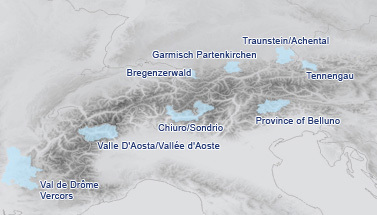 How the aims of AlpHouse can be realized is shown by model projects currently being formed in eight pilot regions spread over four alpine countries (Austria, France, Germany, and Italy). In these regions different typical buildings are selected – historical examples of architecture as well as buildings from the 20th century stock. These pilot objects will be analysed in conjunction with the pilot regions regarding architecture, energy, and settlement geography. Then recommendations will be given for an optimal renovation on the AlpHouse quality level and by making use of regional incentives. Local pilot enterprises will be involved, which will get the necessary know-how by the qualification modules and information services developed by AlpHouse. Building sites thereby also serve as learning sites where knowledge is extracted and model solutions for future renovations are developed.